Jenny Nimmo's Children of the Red King series (beginning with Midnight for Charlie Bone) is one of my favorite fantasy series for younger audiences, and one of my favorites overall. The characters are adorable and the fantasy world fun and creative. Although written for grades 4-6, I enjoyed the series as an adult--I read all eight books. 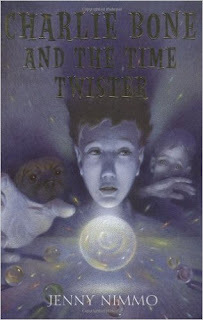 Blurb: Charlie Bone lives with his mother, two grandmothers, and his uncle in London. Life is fairly normal until his tenth birthday, when he starts hearing the people in photographs talking. This doesn't surprise his family as much as it does him. He's sent off to Bloor Academy, a weekday boarding school for the gifted, for those gifted in the arts and for those gifted in other things, like hearing photographs, controlling storms, turning into birds--the sort of strange gifts that only descendants of the Red King have. While Charlie navigates his new school, makes friends, and wonders what really happened to his father, he discovers that the descendants of the Red King have been locked into a generations-long battle between those who choose to be good and those who choose to be evil, that every family is a mix of the good and bad, and that Bloor Academy is a battleground. 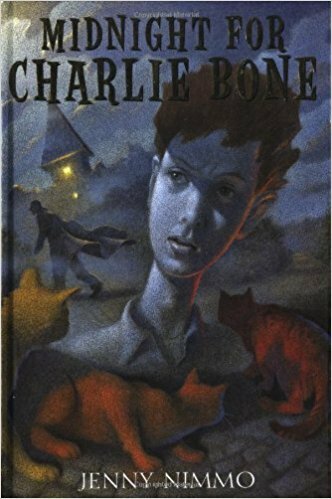 Like Harry Potter, Charlie Bone is a an English boarding school fantasy, but in Charlie's world, people don't use wands and potions and they don't have a separate world to live in undetected, though they do keep their gifts a secret. Charlie and the other descendants of the mysterious Red King simply have "gifts." Unusual ones at that. Charlie can hear paintings and photos, and travel into them. Emma can become a bird. One of their friends can feel the emotions of whoever last wore whatever clothing or cloak he's currently wearing (this is terrible if the last person who wore the cloak was murdered ... but good if he was brave), another can control water, another can write with moonbeams. Have you read any of the Charlie Bone books? If you read books written for a younger audience (as the writers of this blog read and write young adult books even though we aren't teenagers, except for Hannah :)), why do you? Great post! This looks like a really fun series. I will have to keep it in mind. . . Thanks! It is a fun read.